If I’m not a dad, then what am I? It’s a question that’s been hovering around me in recent weeks, pecking away. And it’s this: if I’m not parenting, if I’m not in full-on Dad Mode, then what should I be doing? And, more disturbing, who am I? For some time now my life has been defined as much by my role as a parent than anything else. After my wife passed away, my goals in life seemed to all focus around one main objective: raise the kids. I’m not going to say the task was easy, but at least it was laid out in front of me. When my son was a baby, he would look up at me (usually crying), and I knew it was either time to give him a bottle or change a diaper. My son and I have found new ways to spend time together. Here we are on top of a press box before I broadcast a high school football game. But that was 10 year ago. Now my son doesn’t need his diaper changed (thank goodness), and bottles have become meals. That’s how I’ve spent much of my time over these years. I’ve been organizing, directing, making sure that the kids know what they’re supposed to do, and when they’re supposed to do it. Homework? Check. Chores done? Check. Papers from school signed? Check. Now, however, things are changing. Sure, I still check on homework. But I don’t need to. It always gets done, usually before I ask. And I still have the parent conferences to attend and games to go to. But I can see things are changing. And worse, I can feel them changing. My daughter is grown and almost through with college. And my son doesn’t need me to be the complete organizer of his life any more. In fact, many times he doesn’t need me to do much of anything for him. And that’s where I’m feeling a bit lost. Because if I’m not doing parenting things, what should I be doing? The good news is that as my kids have gotten older, we’ve found new ways to spend time together. New interests to bond us together. 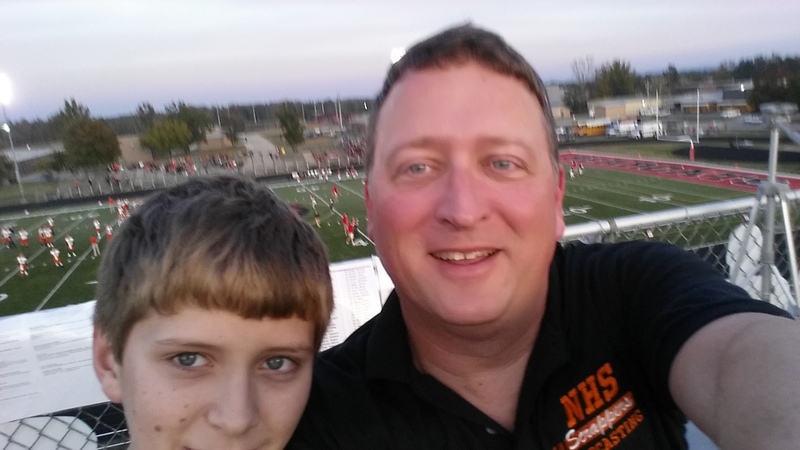 In the last couple of years, my son has started traveling with me to all of the high school games I broadcast on the radio. We go to the movies, and then afterwards enjoy a pizza while we discuss what we watched. There’s air hockey games (which he now regularly beats me) and video games (where he also beats me). And with my daughter there has been concerts. And they both enjoy (translation: have been forced to watch) my watching my bad movies with me. But I’m not still not sure where it’s going. Or exactly what my role is supposed to be. No, my kids don’t need me to do all the little things I used to do for them. But they do still need me in their lives. And that’s something I hope never changes. ← Take whatever you want, but PLEASE don’t take the chocolate! I certainly can’t answer that question for you but I feel like I can say that you made the transition to full time dad and made it yours, you’ll also be able to find your new niche in life now that times are changing. I wish you the best. And thank you for reading and your feedback. Just enjoy it…get some rest and get ready for a new role soon maybe…Grandpa? Ha! I’ve thought about that, and that’s even scarier! You have done an outstanding job being both mom & dad!! Your kids may not depend on you as much, but they know you’ll always be there for them. Believe me, even when their in late 20’s early 30’s they need & depend on you. Just not the same way!! Thanks Cynthia. And thanks for reading. Take this time to find yourself again. Hobbies if you will, Its great you still do things with your kids, Be a great friend to them now but they will always need their Dad. Thank you. Deep down, I know you’re right. I guess I’m just trying to prepare myself for the day when they’re both on their own.